2.Soft touch cork grips: with ergonomic shaping these soft-touch cork-compound grips provide added comfort and secure handling whilst cycling. 3.Small 'ding-dong' bell: a dainty ding-dong bell which sounds an elegant little 'ding-dong' to politely let pedestrians know you are arriving. 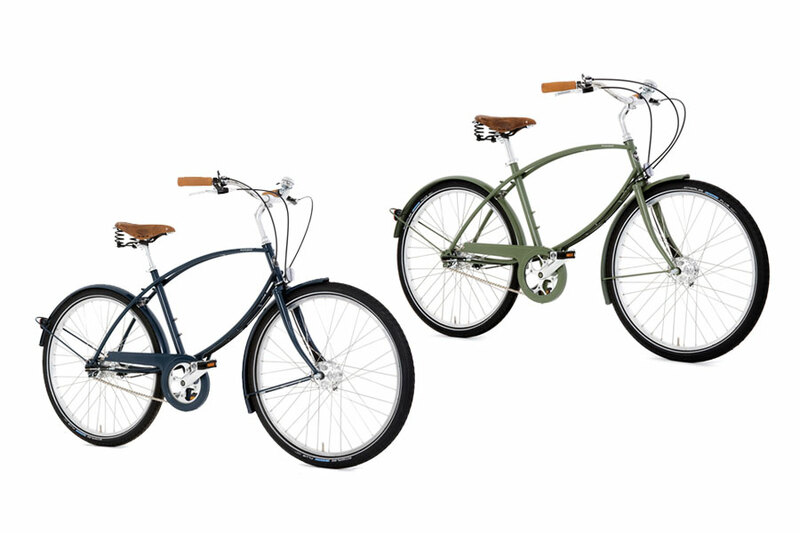 4.Classic 5 speed hub Gears: With an easy-shift gear lever, they allow you to tackle hills and glide along gracefully on flatter terrain with ease. Fully enclosed gear system that requires minimal maintenance. 5.Reflectors for added visibility: front, rear, pedal and tyre reflectors all help to keep you safer on the road at night. 6.Low maintenance hub brakes and gears: enclosed and sealed from all weathers, hub brakes and gears are long-lasting and robust and provide excellent stopping power come rain or shine. 7.Corrosion resistant painted steel mudguards: withstanding the rough and bumps of everyday use, they protect you from mud and water splashes, providing all-weather practicality. 8.Traditional Brooks B67 aged sprung leather saddle: Aged natural leather saddle with elegant tie detailing. Ideal for country rides, absorbing the bumps as you go. Classically sprung for supreme comfort, the softer aged leather makes this saddle comfortable from day one and allows the saddle to breathe and form to your shape over time. With handy rear luggage loops. 9.Quick-release seatpost with saddle micro-adjustment: Allows saddle height to be adjusted and secured with ease and without the need for tools. Fine-tuning of the saddle position and angle can also be achieved for improved/individual comfort. 11.Robust tyres with extra puncture protection and reflective side-walls: Hard-wearing tyres with secure tread design and an inner SmartGuard layer made from a flexible, special rubber that offers extra resistance to shards of glass and pins. A reflective band around the circumference of the tyre walls provide extra visibility after darkness.